Time to Dig in, Boca! Well, Boca Raton doesn’t have the word “boca” — “mouth” — for nothing. This city is serving up some delicious dining experiences, and it has the restaurants to prove it. And while we’re still far from the iconic, shining Michelin stars of New York City, Chicago, or San Francisco, South Florida itself is firing up the food scene with more than 800 new restaurants popping up since 2006 and more than 32,000 foodies who call Palm Beach County home. 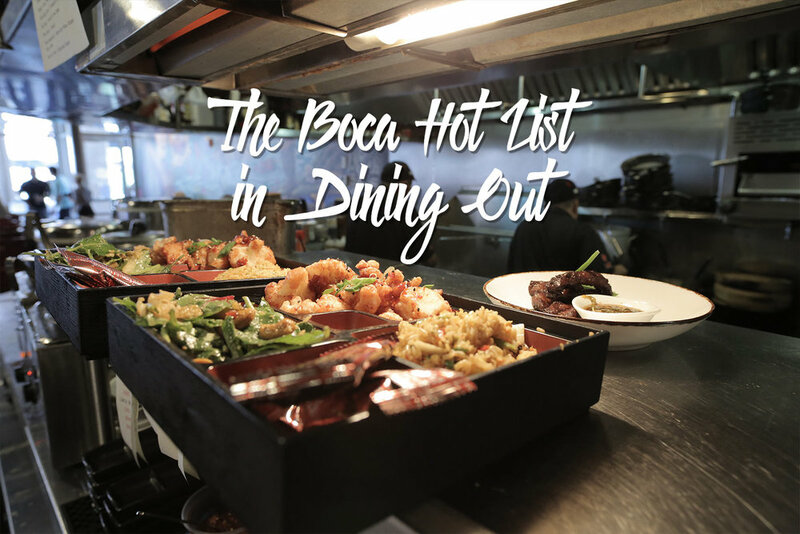 That’s why it’s no surprise Foodable is bringing you “The Boca Hot List in Dining Out” guide! Having a little trouble deciding on your next dinner destination? Our list of the top Boca Raton restaurants will give you 10. How were these restaurants ranked? No, they weren’t editorially selected. They were chosen by the people who matter — you, the diner, and through the unfiltered feedback of social sentiment data. Foodable Labs, powered by the Restaurant Social Media Index, analyzes more than 167,000 restaurant and hospitality brands and over 220 million global consumers across 500,000 foodservice locations. “Our five star system has been designed out of the art of data and more than 20 years of working with operators and guests to understand what it means to have a great restaurant,” Barron said. In this guide, Boca Raton restaurants were measured by three metrics: food, service, and influencer factor. The overall scores were averaged into a 100-point system. Here’s how the ratings in the Foodable Five Star System are broken down. 2-1 Stars: 77 points and below. “Florida is fast becoming a food scene. The movement has been growing for many years, but for the most part, it was just chefs and operators creating their own way. Now the demand by food enthusiasts has really increased just in the past 24 months. I only see this being a bigger trend — with a big ‘if.’ If the travel and tourism can entice more travelers to the area, and if the chefs decide to stay,” Barron said. The future of the restaurant industry in Boca Raton may still be cooking, but without further ado, here are the hottests places you need to visit right now. Time to dig in! Ready to plan your next culinary adventure, Boca? Check out the top 10 hottest restaurants heating up this little slice of foodie heaven in Palm Beach County! So, why do these restaurants outshine the many other options available in the up-and-coming South Florida food scene? We decided to take a look at why foodies can't get enough of these Boca restaurants and eateries. Whether you're looking for an upscale restaurant to celebrate an anniversary or just looking for an high-end authentic Italian experience, a meal at Casa D'Angelo is one you will likely never forget. This fine-dining restaurant was created by the award-winning chef and restaurateur Angelo Elia. Known for its authentic Southern Italian food, the Boca location is an expansion from the original flagship restaurant in Fort Lauderdale. Casa D'Angelo has an impressively large wine menu, like all great Italian restaurants should. The restaurant servers are more than happy to help guests find the best wine option to pair with their meal. Some of the menu highlights include Southern Italian classics such as Gnocchi alla Mamma, homemade potato gnocchi with a tomato and basil sauce, and fresh buffalo mozzarella; Fettuccine Bolognese, a traditional veal and beef meat sauce pasta dish with Reggiano cheese; Angelo’s special lasagna, fresh pasta layers with bolognese sauce, bechamel, mozzarella, and Reggiano cheese; and the Gamberoni vino bianco and olive, sautéed jumbo prawns with garlic and white wine, black olives, and a broccoli rabe and potato medley. But the restaurant offers more than just Elia's culinary mastery — the dishes are made with ingredients of the highest caliber. “The secret is to strive to provide the best ingredients every single day,” said Chef Angelo Elia on Foodable's Table 42 episode. "Join us THIS Saturday - January 28th at Kapow! Noodle Bar as we celebrate the Chinese New Year! We will have $3 draft beer and $5 Jade Chinese New Year Cocktail specials all day long, along with performances by Chinese Dragon and Acrobats. DJ Chris P. gets things going in the courtyard at 8pm." For those Boca foodies looking for pan-Asian in a more casual setting, Kapow! Noodle Bar in Mizner Park offers Asian fusion with a funky and fun atmosphere. Three restaurant and nightlife industry veterans — Scott Frielich, Vaughan Dugan, and Rodney Mayo — all teamed up to start a concept much different from their others. Kapow shares a courtyard with the group's other restaurant, The Dubliner Irish pub, a staple for locals. The restaurant serves small plates, dim sum and dumplings, gyoza tacos, noodles and rice, salads, entrées, and desserts with locally sourced ingredients. Some of the dishes include the Pork Belly Ramen Tonkotsu, which is made of fresh wheat noodles with a six-minute egg, preserved bamboo shoot, and Hon shemeji; the Mongolian Short Rib Bao Bun with pickled fresno, green apple, Thai basil, and sambal; the Saigon Duck Pho with Jurgielewicz Farms duck, bean sprouts, Thai basil, banh pho noodles, and lime; and the unique twist on the pad Thai dish with traditional banh pho noodles, coriander, bean sprouts, egg, lime, and peanut. But since dining isn't only about the food, the interior is visually exciting, while also featuring sustainable fixtures. The dining area has reclaimed wood tables and a bar top made from sorghum straw with a 28-foot painted mural by renowned artist Michael “Pooch” Pucciarelli. Like the atmosphere, there are equally creative craft cocktails to match. The Garden Variety features Tito’s vodka, Thai basil, fresno pepper, lime, agave, and smoked black pepper and The Crouching Tiger with fennel-infused‏ soju, house orgeat, and lemon. Check out the video above to see some of the drool-worthy dishes and the cool and funky interior for yourself. Are you lovin' the farm-to-table trend? If so, Farmer's Table is worth a try. This restaurant serves New American cuisine with locally sourced dishes in a rustic yet sophisticated setting. Owners Mitchell Robbins and Joey Giannuzzi ventured to create a simple, healthy, and sustainable place for health-conscious diners. Like most farm-to-table concepts, the restaurant boasts that all ingredients served have been sourced cleanly and the proteins are without chemicals, hormones, pesticides, and antibiotics. Farmer's Table outlines a long list of facts that sets them apart, like how they "never use or cook with cream or butter. Their primary cooking agent is sunflower seed oil," "believe in keeping the restaurant free of High Fructose Corn Syrup and GMOs," and "only use and serve grass-fed and grass-finished beef." Evidently, the restaurant takes clean eating very seriously. The menu features starters like the 19th Street Tacos, with brisket, wildflower honey slaw, avocado mousse, pico de gallo in a corn tortilla, and the Cucumber "Tartare," with line-caught Atlantic tuna, avocado, cucumber, and herb lavish crackers topped with ginger-chili lime dressing. Then there are an array of salads, sandwiches (for lunch), flatbreads, entrées, Farmer's Table Favorites, and wide variety of vegan and gluten-free sides. Some of the favorites include the Buddha Bowl with stir-fried vegetables, udon noodles, gingered egg, housemade mushroom dash, and a choice between chicken, tofu or shimp; the Pasta-Less Vegetable Lasagna with organic spinach, and Joey's Mom's Tomato Sauce; and the Grass-Fed Beef Short Rib with brussels sprouts, maple-whipped sweet potatoes, and mushroom bordelaise. Although these are the top three restaurants that locals can't stop sharing about on social, there are other delicious Boca gems that made the rest of our list. Some of these include, Rocco's Tacos, which has much more than just tacos and its guacamole is made fresh at your table. Another farm-to-table concept and honorable mention in this guide, Gary Rack's FARMHOUSE Kitchen, has Buffalo Cauliflower that tastes just like buffalo chicken. Then another honorable mention is M.E.A.T. Eatery & Taproom, which serves tasty bar bites and has an impressive beer menu with local and micro brews. Not to mention, it has a unique location in a conference center.